"All of a sudden, I see this cat flying in the air...I was devastated when I saw him. The poor thing bounced as high as my truck." There simply does not appear to be any end to the cruelties that man inflicts upon cats. The latest such outrage occurred on Boxing Day when the driver of a gray pickup truck tossed an orange-colored cat subsequently dubbed Freeway out his window and onto busy I-95 near the exit to Stuart in southern Florida. 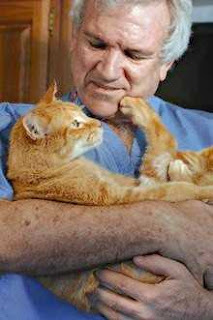 "All of a sudden, I see this cat flying in the air," Catherine Bartron told the Vero Beach Press Journal on January 3rd. (See "Freeway the Cat Survives Toss onto I-95 near Stuart.") "I was devastated when I saw him. The poor thing bounced as high as my truck." Fortunately for Freeway, Bartron is an animal lover who does volunteer work for a no-kill shelter called Dogs and Cats Forever in St. Lucie County. Fighting off a totally understandable urge to go after the miscreant who committed this grossly inhumane act, she pulled over to the side and instead went to Freeway's aid. Although injured and stunned, the cat not only had enough strength and presence of mind in order to make it to the safety of the median but also to fight off Bartron's rescue attempt. Perseverance payed off for her, however, and she was eventually able to wrap the frightened feline in a shirt and get him to a veterinarian. Even then she was not optimistic about his chances of surviving. "There's no way this poor cat is going to make it," she later recalled thinking to herself at the time. The courageous little cat proved her wrong, however. Although he did suffer abrasions to his face, nose, and ears, he did not sustain any broken bones unless one broken tooth counts. His cruel treatment has nevertheless left him with some severe emotional scars that are going to take a while to heal. Specifically, he appears to be suffering from depression. Since the cat was in good health and appears to have been well cared for, Rossen believes that the driver of the truck was not his rightful owner. He is therefore concentrating all his efforts on reuniting Freeway with his family. "I'm not trying to get him adopted. I'm not trying to get him a home," Rossen said. "I want to get him back to his home. I know someone is looking for him." Moreover, it is well established that cat dumping and abandonment are the main reasons millions of cats are slaughtered at shelters and left to fend for themselves in the wild. Mercifully, only a handful of cat owners are so wicked that they dispose of their unwanted felines on busy interstate highways. Bartron did the right thing by rescuing Freeway instead of trying to apprehend the perpetrator of this heinous crime; saving a life should always take precedence over the desire to see justice served. Nonetheless, should this fiend ever be caught he deserves nothing less than a good dose of what he gave Freeway. Photo: Deborah Silver of the Vero Beach Press Journal.